Gold anodized aluminum "Chief Pontiac," 20 feet. Commissioned for Community Bank, Pontiac, Michigan (now 30 North Building). 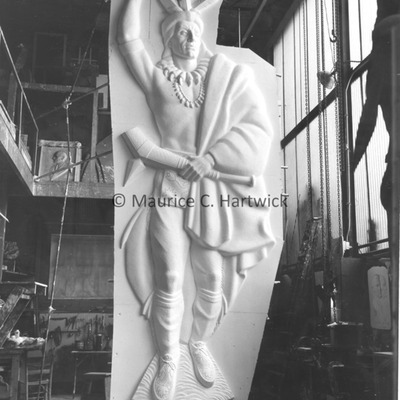 Plaster model for "Chief Pontiac"
Plaster model for for gold anodized aluminum "Chief Pontiac" , 20 feet. Commissioned for Community Bank, Pontiac, Michigan (now 30 North Building). 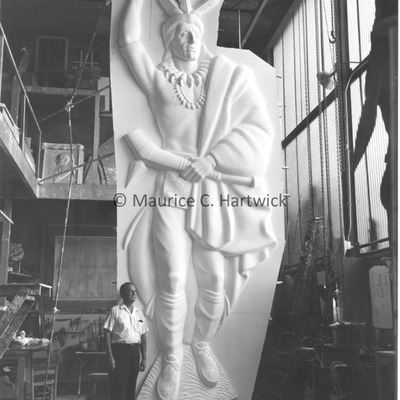 Marshall Fredericks standing with "Chief Pontiac"
Marshall Fredericks standing with the plaster model for "Chief Pontiac". Plaster model for gold anodized aluminum, 20 feet. 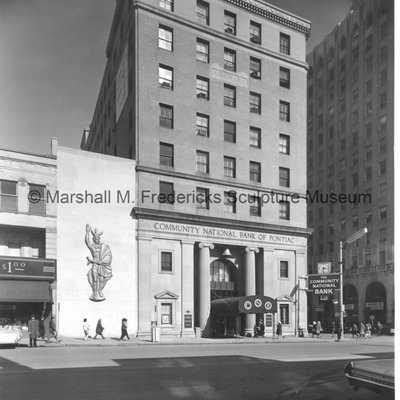 Commissioned for Community Bank, Pontiac, Michigan (now 30 North Building).